Egg freezing (oocyte cryopreservation) is an innovative technology in which a woman’s eggs are extracted, frozen and stored for future use. Egg freezing allows a woman to take control of her own biological clock and bank her eggs for use in the future, preserving her fertility. Delay childbearing in order to pursue educational, career or other personal goals. Objections to storing frozen embryos for religious and/or moral reasons. Egg freezing (human oocyte cryopreservation) is an innovative technology in which a woman’s eggs (oocytes) are extracted, frozen and stored for future use. 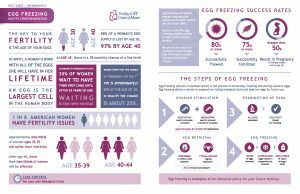 Egg freezing allows a woman to take control of her ticking biological clock and bank her eggs for future use. If infertility is experienced when she is ready to become pregnant, the eggs can be thawed and fertilized, with the resulting embryos then transferred into the uterus. Although not a guarantee, egg freezing is analogous to an insurance policy for a woman’s future fertility. When it comes to issues of fertility, it is a fact that the age of the egg, not the age of the woman matters most. Women are born with approximately 2 million eggs but over time the quantity and quality of healthy eggs decline. This directly impacts the monthly chance of conception. Fertility peaks in a woman’s twenties and by age 30, only about one eighth of her original eggs remain. This reduction in egg quantity and quality increases exponentially after age 35, making it harder and harder to conceive each passing year. The percent of married women not using contraceptives that remain childless without treatment increases with age. The 9% incidence seen in women age 25-29 increases to 30% by age 35. In women 40 to 44 years of age, 64% will remain childless. By age 40, a woman has a less than 10% chance of conceiving a successful pregnancy each month. By age 45 the chance of having a child with one’s own eggs is approximately 1%. birth with Down’s Syndrome increases from 1 in every 1,000 live births at age 30, to 1 in 30 at age 45. Research has found that when women use eggs donated by younger women, they can achieve the same pregnancy success rates as women in their 20’s. 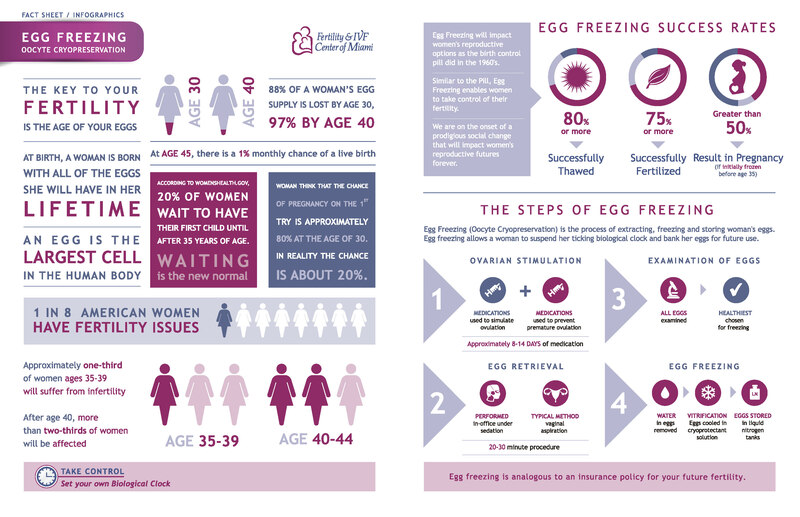 Egg freezing provides an opportunity for women to be their own donors. Women can have their eggs retrieved at a younger age, and preserve them using oocyte cryopreservation technology. Therefore, when a woman is ready to get pregnant, she has her own younger eggs available which increase her chances of a successful pregnancy. After years of research, egg freezing (oocyte cryopreservation) has finally become a tangible reality. In 2012 the American Society for Reproductive Medicine recognized the improved success rates and safety of this fertility preservation technology by removing the experimental label. This occurred after reviewing many scientific and clinical studies which demonstrated that younger women who underwent in-vitro fertilization using frozen eggs had a similar chance of successful pregnancy as those using fresh eggs. The research to date also suggests that babies born from frozen eggs are no different than those born as a result of IVF with fresh eggs. Now is the time to set your own biological clock.